In the predawn darkness outside the Bryce Jordan Center at Penn State, it sounded like an all-night rave was in full swing, complete with thrashing guitar music. Inside, a kaleidoscope of colors – thousands of students wearing bright T-shirts of blue, green, red, pink, white, yellow and purple — filled the arena. From the upper seats, it looked like a living pointillist painting. In the corridors, grown-ups, many of them parents of students, such as myself, wore the thousand-yard stares that come with being up too early with too little coffee. But in the arena at 4:45 a.m., the energy level was soaring. The students were nearing the 12th hour of what would be a no-sitting, no-sleeping 46-hour dance-athon known as THON. The event, described by organizers as the largest student-run philanthropy in the world, raises money to benefit kids with cancer and their families. For those of a certain age, it’s reminiscent of the Jerry Lewis Labor Day telethons that raised money for the Muscular Dystrophy Association. Unlike those of telethons of old, which relied on a stream of appearances by an assortment of Grade B celebrities and entertainers, THON is fueled by more than 16,000 student volunteers. • 16 committees oversee everything, from public relations to operations and security. The volunteers are designated by their different colored T-shirts. 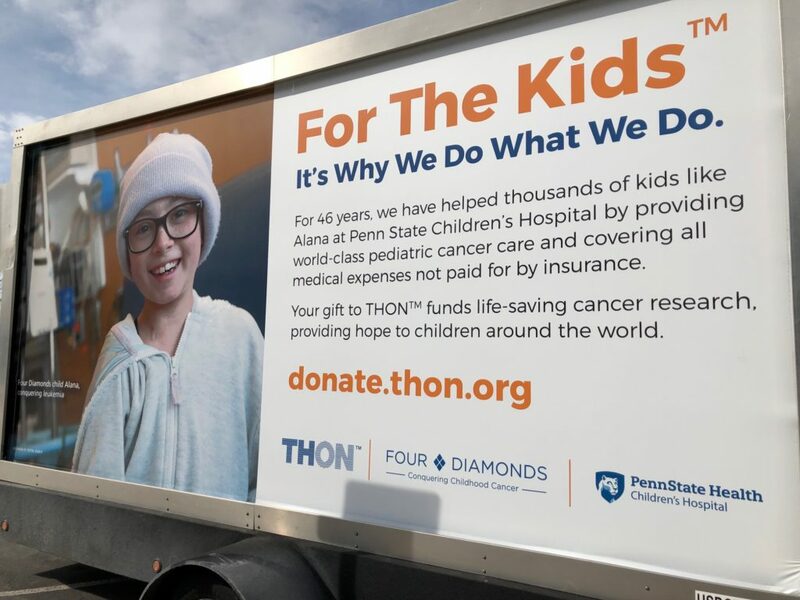 • $10.6 million raised in 2019, with the money benefitting pediatric cancer patients and their families at the Penn State Milton S. Hershey Medical Center. Those families never get a bill for what insurance does not cover. 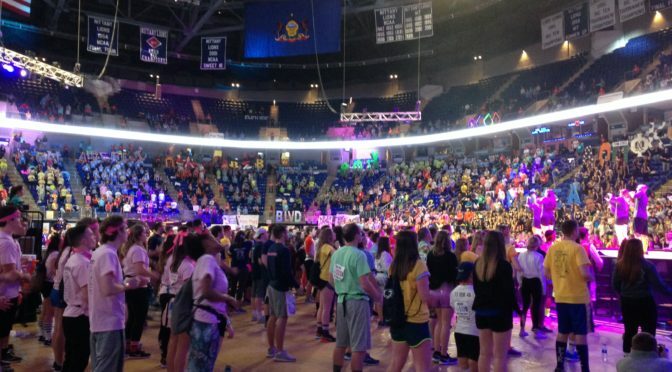 • Since THON’s start more than 40 years ago, it’s raised $157 million. The arena during THON has the feel of a bustling airport, political convention and Olympics opening ceremony all rolled into one. Look beyond the sheer logistics and details of organizing, however, and you will find at its core an indomitable spirit of giving, empathy and commitment. The uniting principle of THON is “For the Kids,” and it is on display everywhere: Posters created by students and families, head bands that say “No Hair, Just Don’t Care,” worn by students who have shaved their heads in solidarity with pediatric cancer patients, photos and, of course, the T-shirts. Families and cancer survivors came on stage and offered powerful, moving testimonials. Parents whose sons and daughters did not survive also paid tribute to their loved ones, followed by a slide show of those who died. It occurred to me about halfway through the slide show that it was fitting that college students – filled with the energy and exuberance of youth – tackle such a monumental undertaking as helping kids with cancer. Adults, especially parents, would be too crippled by the enormity of the undertaking. I know I would be, and my boys, thank God, are healthy. 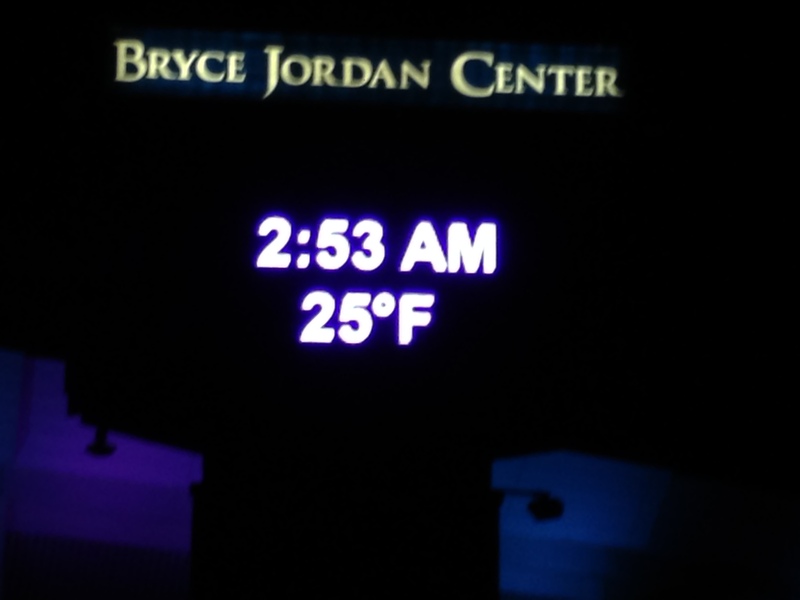 It is nearly 3 in the morning on the Saturday of Presidents’ Day weekend and the Bryce Jordan Center at Penn State University in State College, Pa., looks to be hosting a celebration that is a cross between a rave and Mardi Gras. Inside the arena, music loudly thumps and lights flash. The stands are filled with more students who gyrate and jump to the music. Large cutout letters representing the names of various sororities and fraternities are outlined with strands of glowing Christmas lights. I am still trying to figure out how they kept them lit without plugging into a outlet. Probably engineering students. The arena floor is an ant hill of activity, with more students dancing, clapping and chanting. The energy level at this hour is at a 7 and by the time the weekend finishes, it will be cranked to a 12 and the students will have torn off the dial. Instead of heading to ski slopes or heading home for the holiday weekend or returning to their dorms after a night of drinking, these students instead dedicated themselves to a charity fundraiser known as THON. THON is a 46-hour dance marathon and the capstone of a year’s worth of raising money and awareness in the fight against childhood cancer. It is two days of no sitting and no sleeping. And that’s no kidding. Even spectators from the public who come to observe are expected to stand in a gesture of respect and support. 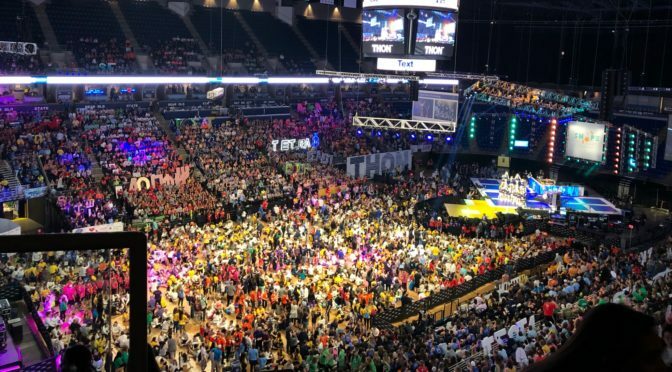 THON, the largest student-run philanthropy in the world, involves more than 16,000 students in various capacities, and on this weekend, 707 dancers will be supported by members of 16 committees. Some of the dancers had to raise a minimum of $2,800 to be eligible to be entered into a random drawing so they could have the privilege of being on their feet for nearly two days. Last year alone THON raised $10 million for the Penn State Children’s Hospital in Hershey, Pa. Since 1977, it has raised more than $146 million. Reaching that level of success is an audacious undertaking requiring enormous planning and dedication. A colleague who went to Penn State told me he had a cold dead heart but that THON touched him deeply. I can now see why. This will sound corny, but I was immediately moved by the good will that THON represented. Maybe I was tired from the three-hour drive, but I was an emotional basket case as soon as I stepped inside. The cheer and verve on display would melt the heart of any cynic. Testaments to the cause were everywhere. THON keeps the families of children with cancer in the forefront, with families actually attending the event and given a private setting to gather. The logistics of pulling this off cannot be overstated. We are talking Disney-scale behind the scenes planning for a weekend involving a core of 3,300 student volunteers who oversee everything from security to sanitation. Dance relations committee members partner with designated dancers to see to their care and feeding, going so far as to sneak in pizza and steak dinners for those who have pledged not to sit for 46 hours. The volunteer committee members, like my son Daniel, who is a sophomore and made the unusual catapult to the rank of captain of the public relations team, get two four-hour sleep breaks. Not that they take full advantage of the down time, of course. Dan Mele explains things to his old man. Daniel led us a through a backstage tour of the maze of hallways and stations that make up THON and introduced us to a number of key players along the way. And here is the thing: To a person every single volunteer and student we met embraced the challenge of the weekend with a smile and an enthusiasm reserved for little kids on Christmas Eve. 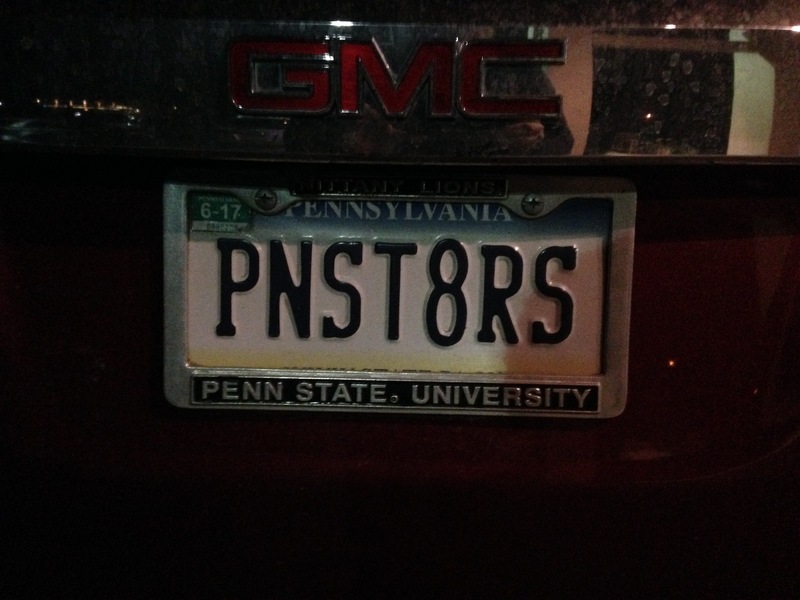 Penn State’s school spirit is legendary, bordering on cult-like. So chalk up that cheeriness and can-do spirit to youthful energy and naïveté and maybe whatever they put in the water in Happy Valley? But that is the cynic’s view. 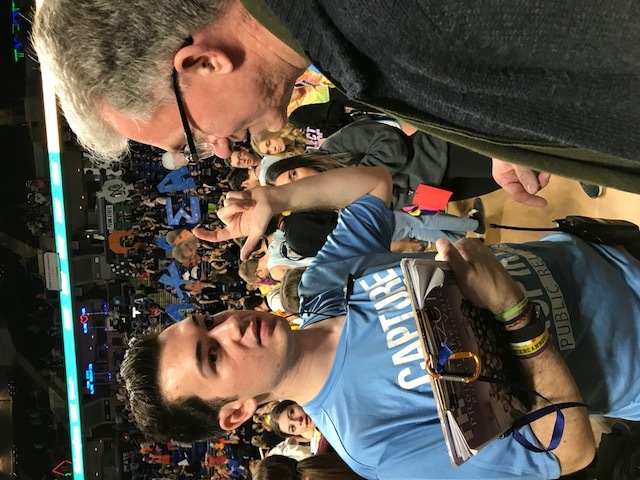 In a week scarred by the loss of 17 lives in a shooting at a Florida high school, visiting THON was a chance to renew my faith in selflessness and humanity’s desire to do good. THON shows a cause can transcend politics, party affiliation, divisive beliefs and cultural and ethnic divides and we can rally to do something good FTK: For the Kids. To donate, go to THON.org. 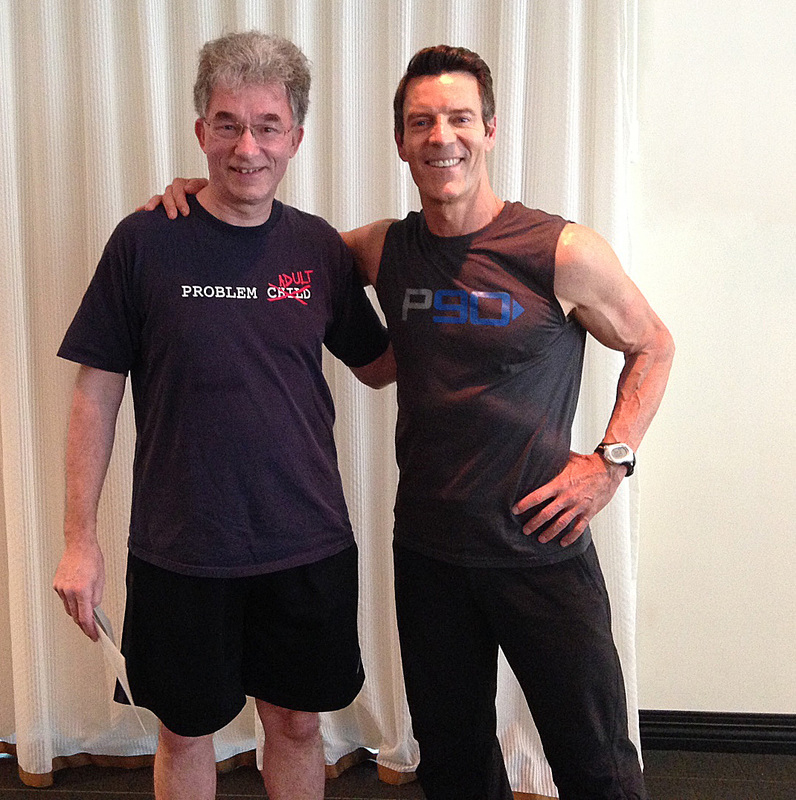 I am no celebrity worshipper, but I have to confess I was nervous about meeting exercise guru Tony Horton. For my 50th birthday, my bride got me (among other gifts) tickets for this year’s Central PA Health & Fitness Expo at Penn State’s Bryce Jordan Center. 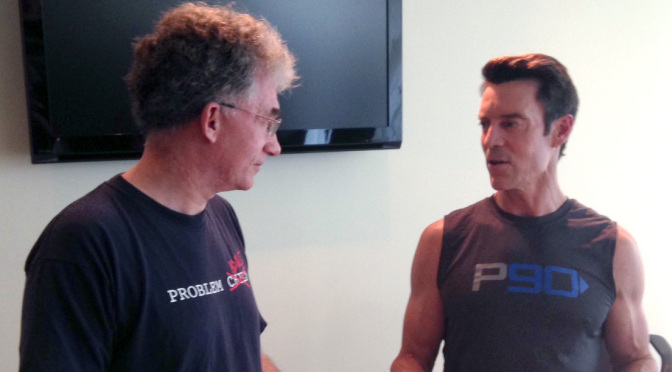 The centerpiece of the event was a meet-and-greet with Tony (he of the P90X workout fame), a chance to hear him as a keynote speaker, and, best of all, to participate in a workout he was leading. So here I am on line with dozens of others, waiting to meet Tony, shake hands, chat and get an autograph and a photo. The closest I’ve ever come to a brush with celebrity was in 1978, when I met then-New York City Mayor Edward Koch and got his autograph. Though Koch was the leader of the greatest city in the world, he did not sell nearly five million pieces of exercise DVDs closing in on nearly $1 billion in sales. That distinction would belong to Tony Horton, who I was getting closer to meeting as the line progressed. He could not have been more warm, gracious and funny. A total mensch. I told him what an inspiration he was (he’s 56 BTW and totally shredded) and at one point I put a hand over his and told him I was sorry about his dad’s recent death. His composure changed visibly. You could see he was truly touched by the sympathy. He called his dad’s death a “goofy,” unexpected loss and said he should have had 10 more years in him. He was totally genuine. Not an ounce of phony. He was super generous with his time. My favorite advice? Don’t feel 100 percent? Go and work out anyway. “Go in there and stink it up” by giving only 20, 30 or 40 percent. But just do it. He spoke enthusiastically and passionately about exercise, about overcoming his own obstacles in life (a grade C student with a speech impediment who in his early adult years was $60,000 in debt). And then came the workout. I never smiled so much busting my hump as I did this day. I was joined by 130 others who jumped, grunted, burpeed, ran and push-upped our way through the 40-minute routine. Tony roamed the room, coaching people, encouraging them and correcting their form. 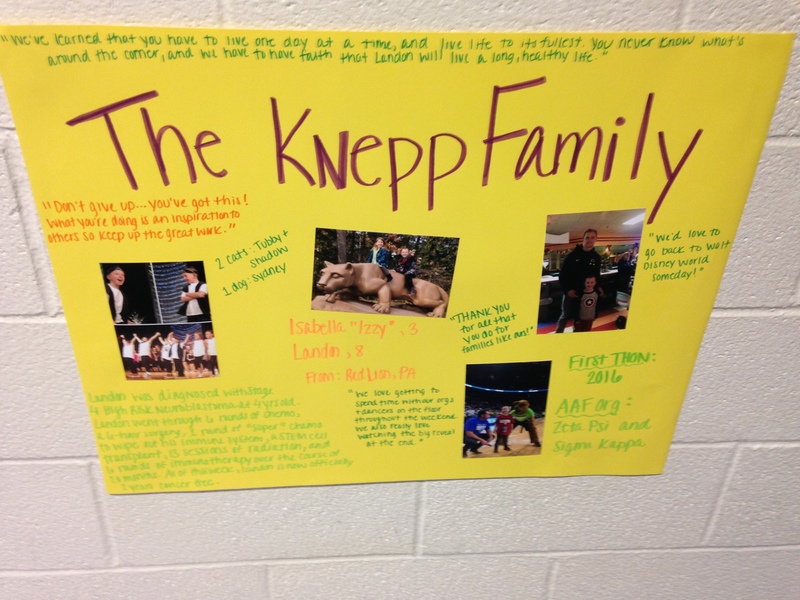 The capstone came at the end of the workout. I turned to this guy next to me (in his early 30s, I would guess) and I told him how he had absolutely crushed the exercises. I told him I turn 50 in a couple of weeks.